Decks are great additions to a yard and living space. They provide an outside gathering area to grill, sun bathe and just sit and relax. The deck designs vary and the materials to make it also can vary from wood to plastic materials and combinations. The deck-building project can be influenced by the landscape of your yard, your budget and even how much sunlight the area will get. Deck stain comes in many colors, as well. Some are light and some are dark, but the benefit of the stain is that you can adjust the tint a bit. The color of your deck can add to the overall look of the yard and the house. Being able to match or complement the color of your house with the deck color can make it look as though it had been original construction and not an added on part. Deck design might be the most fun because you can think about what youd love to see as a part of your yard. Some designs have multi-level areas that follow the landscape of the yard. Hills, trees and shrubs add to the natural appearance and can nestle the deck nicely into the area that it is built. 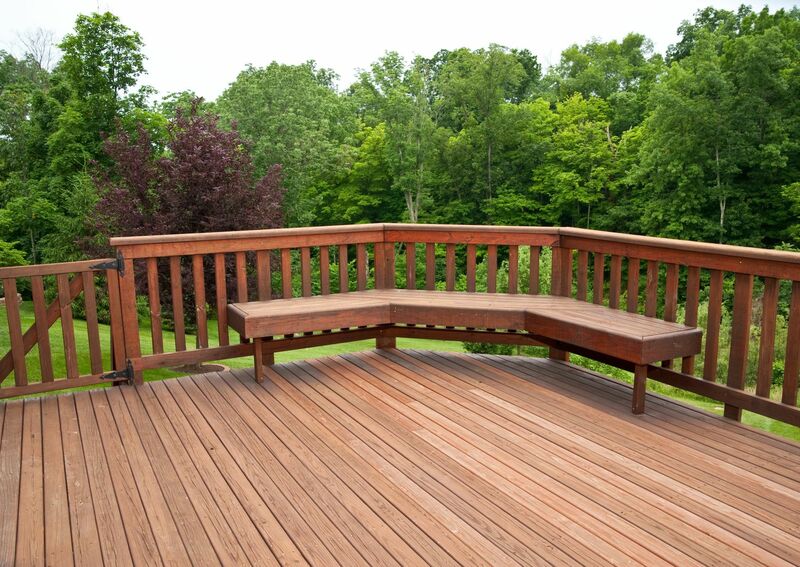 If your deck doesnt get much light, getting some mold resistant stain might be advised. Creating a design for a deck can be done on the computer, online or by a builder or contractor that can install the deck for you. Some computer software will allow you to manipulate the designs and the deck stain colors. There are also designs that you can download from the Internet. With these you can even figure out how much lumber and hardware that youll need and how to begin the project. This software and the plans that you can download are great resources if you plan to do the work on your own. If you hire someone to put on the deck, then the plans you download might be useful to the person who will do the work or they might want to do their own plans for you. If you have an idea how much the supplies will cost for the project, then it may keep you from being overcharged from a contractor who inflates a cost for the work. Checking Angies List and asking for referrals or photos of work that has been done by that person can avoid a problem during the work. Something else to consider is whether you will need a building permit to do the work on the deck. Some communities require a limited one for the work, so the cost of the permit might cost less than a full building permit. Having the deck looked at for safety after the construction is done is not mandatory, but if you do the work yourself it might be a good idea to have someone double-check the work. Once the deck is finished, you may need to apply varnish again at the end of the season or the next season to keep it looking nice and to keep from making repairs to rotten wood. The Home and Garden website can offer some tips for keeping a deck clean and for applying stain and varnish. Decks add charm and value to your house. Being able to go outside and enjoy the surroundings that your yard provides can be a wonderful way to take advantage of spring, summer and even fall weather. Doing the things you love like grilling, eating at a picnic table, reading and sunbathing on your own deck can make a staycation a great experience.